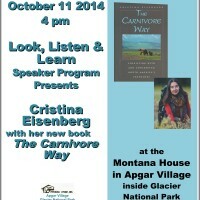 The Montana House is pleased to present another in its 8 years history of Look Listen and Learn events ─ this time with science writer and wildlife ecologist Dr. Cristina Eisenberg. Her presentation will be based on her just released book The Carnivore Way: Conserving and Coexisting with America’s Carnivores, and on her scientific research. 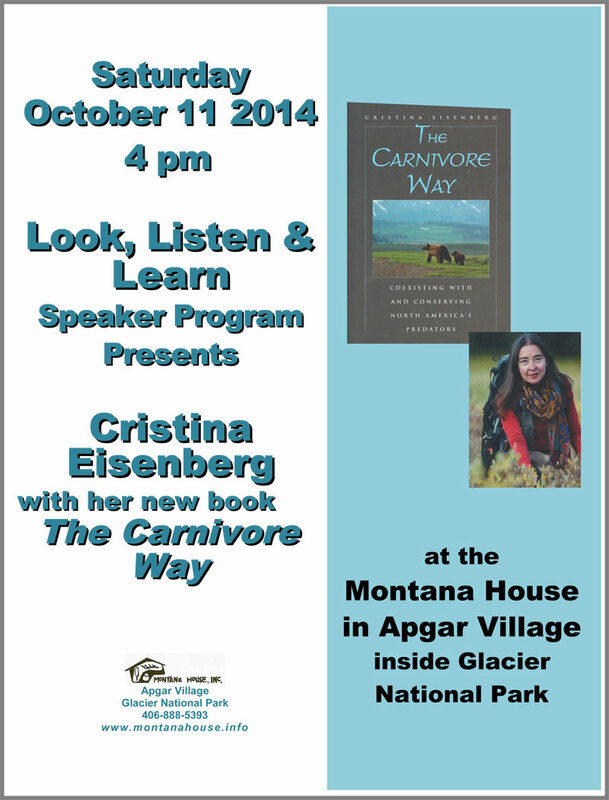 The event will be at 4pm Saturday afternoon, October 11th at the Montana House in Apgar Village, inside Glacier National Park. “What would it be like to live in a world with no predators roaming our landscapes? Would their elimination…bring about a pastoral, peaceful human civilization? Eisenberg argues compellingly for the necessity of top predators in large, undisturbed landscapes, and how a continent-long corridor ─ a “carnivore way” ─ provides the room they need to roam and the connected landscapes that allow them to disperse. The presentation at the Montana House will be at 4 p.m. with time for questions, and a reception will follow. The event is open to the public without charge, but seating is limited, so reservations are needed. Please call 406-888-5393 for additional information and to reserve your seats. Hans and Toni Jungster established the Montana House Regional Craft Shop in 1960 in Apgar Village, just inside Glacier National Park. Their daughter, Monica and staff continue to carry on their mission: to celebrate and promote the creativity of Montana and Native American artists and craftsmen for our mutual benefit. The Montana House has been a long time avid supporter of Glacier National Park and celebrated its own 50th anniversary on June 26, 2010.